Complete dentures are designed to replace teeth in an entire arch when all the teeth are missing. Partial dentures are used when there are some teeth still present in the arch. Complete dentures consist of an acrylic base to imitate gum tissue, and teeth that can be made of acrylic or porcelain. 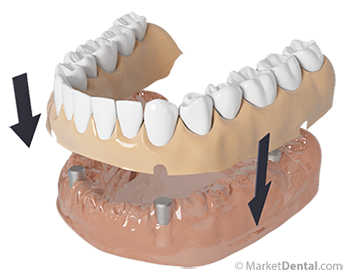 The denture base is made to closely fit the contours of the arch to ensure the denture is stable during normal oral functions such as eating, speaking or swallowing. Partial dentures can be made with a metal framework and teeth attached in the areas where the teeth are missing. The metal framework also has clasps or arms that extend out and fit around some of the existing teeth. The combination of the framework and the arms that wrap around some of the teeth keep the partial denture stable during eating or speaking. It is important for patients wearing dentures to maintain dentures as well as teeth and gums in good oral condition. Our dentists will provide all necessary information for patient education. If you are looking for an experienced dentist in Toronto for both complete and partial dentures, please give Yonge Dentistry a call at (416) 489-6955 to schedule a consultation with our dentist.